Reprint. Originally published: New York: The Dial Press, 2016. The last days of five great thinkers, writers and artists - as they come to terms with the reality of approaching deathKatie Roiphe's extraordinary book is filled with intimate and surprising revelations. Susan Sontag, consummate public intellectual, finds her rational thinking tested during her third bout with cancer. Seventy-six year old John Updike's response to a fatal diagnosis is to begin a poem. Dylan Thomas's fatal collapse on the floor of a Greenwich Village tavern is preceded by a fortnight of almost suicidal excess. Sigmund Freud understands his hastening decline. Maurice Sendak shows his lifelong obsession with death in his beloved books. 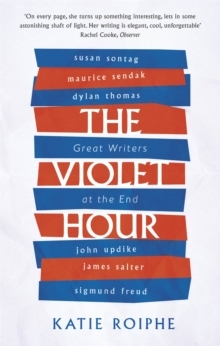 The Violet Hour - urgent and unsentimental - helps us to be less afraid in the face of death.